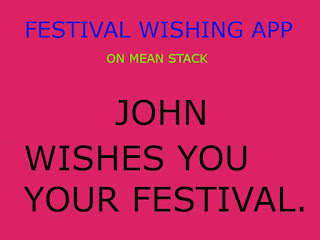 Today we will create a Wishing Website On MEAN Stack. There will be one webpage which takes a username in a textbox and show the wishing message with the username on the top of the page. You can actually call this a festival wishing webpage or and user welcome page using a query string. If you have heard about query string for the first time then, It is a text which is passed as a URL on the top and fetched but some element of the page. NPM packages to be used. I will not show you how to install these now. I will write another post real soon on this topic and update this one. 1. Create a file on the desktop name it anything you want. 3. Type npm init and create a JSON File. Rest, hit enter no need to change anything. 5. In your git bash command line, you have to install those packages mentioned above. Type these, one by one. 6. Now create two more folders inside your main folder. Name them like public, views respectively. and don't name it something else name them as given here it is essential of the project. 7. Inside of the views folder, we will create a new EJS file name it anything with .ejs extension at the end. 8. Inside of the public folder, we will create a new CSS file name it anything with .css extension at the end. I have used an image from Wikipedia you can change as per your requirement and add it to your code. You can change the creator name and the wishing text to anything. rest should be the same. We are done, we have created the CSS for style and the HTML file using EJS. 11. In your git bash command line type node app.js or nodemon app.js (If you have installed nodemon as a package) else use the above, both will work fine. 12. Open a Web Browser, I will use firefox. Type localhost:3000 on the address bar BOOM!! it works. Enter your name in the text field and hit submit button, it works! Here is the link of complete sample project hosted on Heroku. If you want to host your app for free like I did use Heroku to host it. Below is a link to a guide provided by Heroku you should check, it`s super easy to follow.